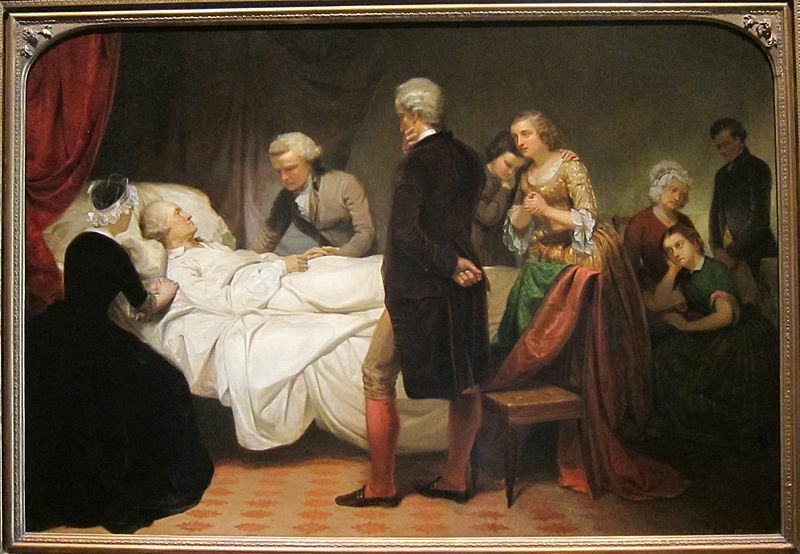 At 67, Washington was already thinking about his deathbed. And although with one hand he kept firmly fighting the Jeffersonians, he was drafting his will with the other. He drafted it in silence and secrecy, without telling a soul—and it is in this document where his struggle with slavery, and his true opinions of it come out. I have not spoken much about slavery throughout these posts because it was always under the surface. You could notice it here and there, but it wasn’t big enough to make it into the previous posts. But is time we talk about it because it is a very important issue, and one of the biggest hypocrisies of the American Revolution—and the Southern Founding Fathers for that matter. “All men are created equal” the declaration of independence claims... drafted by Jefferson himself. Yet every single plantation owner in the South owned slaves. There is clearly something wrong with this picture, but the problem was that slavery was one of the most important economic drivers of the country at the time. And this economic aspect was the reason why Washington couldn’t oppose to it. Without slavery he would have never had the financial success he had (or so he thought). 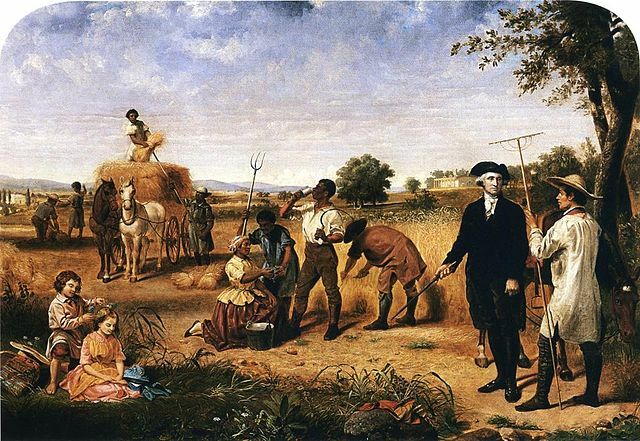 Even though Lafayette constantly wrote to Washington about his despise for slavery, and even though the most influential persons in Washington’s life such as Franklin and Hamilton were strong supporters of abolitionism, Washington could not side with them—because that would leave him in ruins. As I read this book I could feel that deep inside Washington opposed slavery, and that he was just cursed with it. Many of his contemporaries claimed that he was very good to his slaves and that he rarely inflicted severe punishments. However, there are other aspects that made me feel ambivalent about his true feelings. For example, when he was staying in Philadelphia during his presidency, there was a law that if any black person resided for more than six months in Pennsylvania, he or she would become a free person after that time. The loophole was that if they left the state (even if it was for a day), the clock would reset. Washington, Martha, and his personal secretary, kept this in secret among their workers, and had the slaves go back to Mount Vernon every five months or so, giving them some silly excuse. Something that makes me quite sad, and makes me doubt his moral values. There were also instances where Washington and Martha went above and beyond to chase after runaway slaves. You would think that if he really craved their freedom deep inside he would just let those few instances slide. As we come to the end of this post, you might be wondering how did this legend pass away. He had outlived everyone in his family. He was the first and last living Washington from his Father’s second marriage—and still, he showed no signs of severe declining health. Let me remind you that most of the men in his family died very young, and here he was, at 67, still alive and kickin’! “Washington as Farmer at Mount Vernon”, part of a series on George Washington by Junius Brutus Stearns. One winter evening, on December 12th 1799, despite the snowfall, Washington went for the usual four‑hour tour of his farm on horseback. When he got back, some visitors were waiting for him, and as attentive as usual, he sat down to hang out with them without changing his damp clothes. The next day he woke up with a mild cold, and although his personal secretary told him to take some medicine he brushed it off and said that it was just a cold, and that he would “let it go as it came”. That night, he woke up with an inflamed throat and told Martha he was having difficulty breathing. They decided to wait until morning to call Dr Calik whom he knew since the days of French‑and‑Indian war. But before the doctor came that morning, the breathing had become an agonizing task—it looks like he had contracted some kind of a bacterial infection that caused severe inflammation of the trachea. Being the problem solver he was, he told one of his servants to bleed him... Yes, bleed him. The servant was afraid to do it but Washington gave him comfort. He even told the servant to poke a bigger hole seeing that the first one wasn’t drawing enough blood. By the time the doctor got there he had already lost a pint of blood. And if you thought the doctor would put a stop to that nonsense as soon as he saw it, you are wrong! This is 1799, the doctor concurred, and the bleeding kept going. To continue the barbaric practices, they made Washington smell the fumes from a boiling mixture of water and vinegar, making him gag and bleed even more. Unable to help, they called for another doctor, who among other useless things, suggested to clean his bowels using an enema. Still no improvement. A third doctor was called in, and he suggested a tracheotomy, the right procedure to do—but perhaps before the bleeding. His suggestion was overruled by the other two doctors2. After losing about five pints of blood, Wasington saw himself fading away, and with an incredible calm and composure told the doctors that he was ready to go, that it wasn’t their fault, and that he was very grateful for their service. Despite bleeding out and choking to death for hours, Washington never complained, never despaired. Even while struggling to breath, he noticed one of his young slaves had been standing for quite a while, Washington told him to sit down, that it was going to be ok... This shows the incredible level awareness, judgement, and self‑control this amazing individual had. Washington kept his composure until the last moment when he checked his own pulse5, and took one last, agonizing, and difficult breath. He was gone, and Martha would never sleep in that room again. With this, the greatest hero and the father of the most powerful country of the new era passed into history as something more than a mere mortal. People attempted to tell his story for many years to come, but being the private man that he was, a lot of his personality got lost in the letters. With each biography that was written, he became more and more that stone‑cold and distant figure that history books show us nowadays. Some people took advantage of his distant and mysterious personality to make up stories about his life, attempting to associate moral or religious values to him. Among these made up stories we have the cherry tree that he chopped down when he was a kid, and feeling guilty, he confessed the truth to his father because “he couldn’t lie”. Or the one where he threw a silver dollar bouncing across the Rappahannock River. 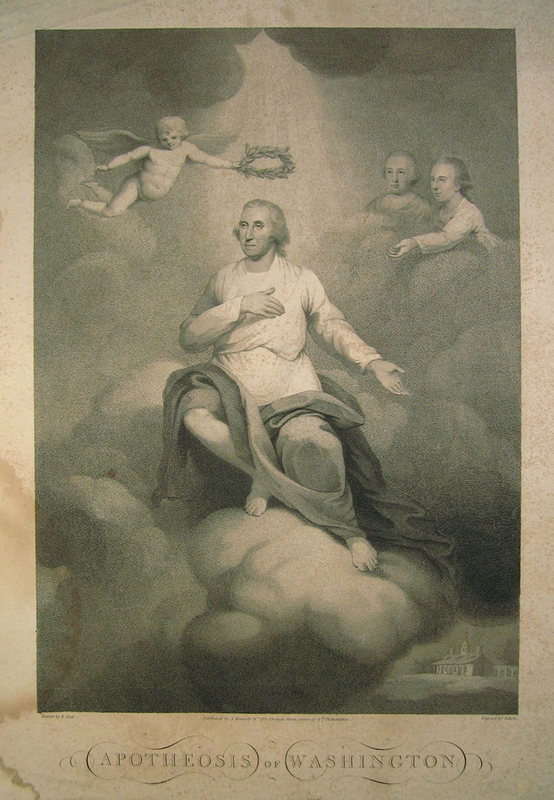 Or even the painting of him praying at Valley Forge when he had lost almost all hope. None of these happened. But what did happen was that a fearless young general got sick of the army, and became a very successful planter and businessman. He was then called back to command a malnourished army towards freedom and succeeded against all odds. This gave birth to the first independent nation of the New World. But he didn’t stop there, because when this new nation called for his help a second time, he managed to restore its credit, create a mint, a coastguard, a bank, a customs service, a diplomatic corps, etc. etc... All while evading the bullet exchange between Federalists and Republicans, as well as by abiding to the constitution. Proving to generations to come that the president was and will always be: a servant of the people. The biggest badass in American history was the first badass in American history, and his name was George (motherfucking) Washington! One of the things that the United States has been known for in the last 240 years is to be the pioneer of ideas that are later copied by other countries. From the aforementioned three branches of government, to numerous things like art, technology, and even pointless things like reality TV. It seems like the US is always at the forefront of revolutionary ideas. Do you think this is owed to the fact that the American Revolution happened before other revolutions? What if it hadn’t been the first? I ask this because it seems like in the absence of a role model, original ideas are more common, and I believe this is one of the main reasons why the US has been such a success. Do you agree with that? Do you think that IF the US had had a model to look up to, its industries and inventors would have resorted to replication? In other words is innovation a result of a position of leadership? Or is leadership a result of innovation? Alright guys! Thank you guys so much for reading, and don’t forget to read more. But don’t read books just to say you did. Read them consciously! And write about them, for it is the only way for them to stay solid in the mind.